Hutting in the hills: opportunity or threat? The "Thousand Huts" campaign (www.thousandhuts.org) was launched a few years ago by Reforesting Scotland (RS), a "grassroots charity" which until recently has concentrated on "restoring the land and the people" by means of projects, publications, policy work, and "from time to time treeplanting" (www.reforestingscotland.org). "Hutting" is seen as a modern/future development of "Scotland's hutting heritage" from the first part of the 20th century, when single or grouped huts appeared, mainly in the Central Belt, such as at Carbeth in Stirlingshire, where 140 current-day hutters have recently bought the land. RS has worked hard to get the campaign off the ground, by getting planners and architects on board, and by approaching politicians. 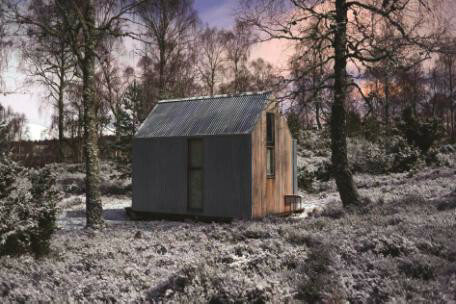 A recent (public consultation) by the Scottish Government, which ended in February 2016, asked for views on relaxing building regulations for "huts and bothies" (see below), the main aim being to make their construction more affordable. The consultation proposed a "new building type", defined as "a detached single storey residential building comprising a hut or bothy used for shelter or sleeping accommodation in connection with a relevant activity, [i.e.] mountaineering, climbing, hillwalking, rambling or other similar activity". It would exclude a "dwelling", a building over 30 m2 in area or within 6m of another building or a "boundary" (undefined), a "wastewater disposal system" (e.g. a toilet, or shower stall), and a "hut or bothy containing a raised floor or platform which is open to the room or space into which it projects". To safeguard human health and safety, conditions would apply as regards construction (to prevent collapse), and "fixed combustion" (including exhaust gases). Four questions asked for agreement or disagreement with these proposals, and for any further suggestions or comments. There were (at least) 115 responses: 40 from organisations including RS, MCofS, MBA, NTS, HIE, SLE and several estates, and Aberdeenshire and other Councils (but not the Cairngorms National Park Authority or many mountaineering or other outdoor clubs), 44 from named individuals, and 31 anonymous. Some of these responses are summarised below. The Government's response is awaited, but may be delayed until after the May election. On 23 February 2016, RS launched "New Hutting Developments", a 27-page booklet of "good practice guidance" at the Scottish Parliament, hosted by Angus Macdonald MSP, and attended by Cabinet Secretary for Rural Affairs Richard Lochhead MSP and attended by about 80 people (including myself but not, as far as I could discover, MBA or Forestry Commission representatives; see below). This event indicates considerable political weight behind the hutting initiative. Scottish Planning Policy (SPP) is now "supportive", and defines a "hut" as "A simple building used intermittently as recreational accommodation (i.e. not a principal residence); having an internal floor area of no more than 30 m2; constructed from low impact materials; generally not connected to mains water, electricity or sewerage; and built in such a way that it is removable with little or no trace at the end of its life. Huts may be built singly or in groups". The consultation document specified that: "Huts and bothies in terms of the exemption are intended to be referred to as recreational buildings that are used for a relevant activity and sited in a remote or rural location (i.e. not urban or suburban), and will not be classed as a dwelling or a building ancillary to a dwelling. This proposed exemption will limit huts and bothies to being single storey detached buildings with a floor area no greater than 30 m2." However, buildings may or may not be regarded as "huts", either in debate or - eventually - in law when regulations are relaxed. These might include chalets, pods, cabins, semi-permanent tents, and bothies (whether farm and/or mountain is usually not specified), but (in RS opinion) would not include shipping containers, caravans, portacabins, and buildings made of materials with high ecological and visual impact, such as breeze blocks (even if re-used?). There is also the question of what may be called "ancillaries", such as toilets, car parking, and pathways, as well as gardens, lawns and fences which may be desired by hut users though RS wishes huts to "preserve the natural character of the landscape". And while the SPP definition above specifies "generally not connected to mains water, electricity or sewerage", this is an obvious loophole that some will want to exploit; solar panels are an obvious possibility. 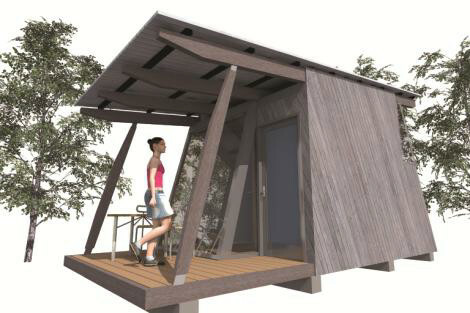 The proposed relaxation would exempt new huts from most building regulations, focussing only on "key health and safety considerations". Although existing huts and bothies are not involved, restoration, extension, etc. of these might apply. Obviously, landowner consent is needed, and also planning permission (if sought?!) is needed, which would be difficult if not impossible in environmentally designated areas such as "wild land", SSSIs, etc. In practice, the Local Development Plans for councils and the two National Parks will be key documents covering this area in future, since they will set out the guidance and criteria which local planning authorities will use when faced with hut proposals. At a more technical level, RS plan to issue a Good Practice Guide to Hut Construction later in 2016. The 23 February meeting threw up the possibility that "corporate hutting" might emerge, as in Norway, where Statoil - presumably with a lease from the landowner - was said to rent "hytter" on a weekly basis. This would of course be rather different from the independent, family-oriented "vision" of the hutting campaign. Exemplar contracts for leases, services, etc. will presumably emerge in due course. Concern in NEMT circles (as well as within the MCofS and MBA, both of whom are keeping an eye on the hutting campaign) will presumably focus on whether huts might spring up in "undesirable" areas, whether in or en route to mountain areas, and give rise to problems such as visual intrusion, parking, toilets, "privatisation", litter, etc. It will be noted that the Scottish Government consultation added - apparently at the suggestion of the MBA - the category of "bothies" to "huts". However, the only sentence distinguishing one from the other is: "Unlike huts, bothies are predominantly existing buildings that have been traditionally used as shelter or are older, sometimes derelict, buildings that have been improved for use as mountain bothies". The landowner organisation Scottish Land & Estates (which has a members-only Information Note dated 2012 on bothies) responded to the recent consultation in generally positive terms. It raised only two concerns: that the definition of 'relevant activity' provided suits the use of hill bothies well but is less suited to the use of huts where spending leisure time at the hut is often the main activity; and that the phrase 'remote or rural location' is well suited for bothies but may not suit the understanding of hutting as accessible to urban and suburban locations. The MBA response, pointing out that it did rarely builds new bothies but rather restores old ones, believed that the proposed exemption would not affect its work in any way. It argued the case for sleeping platforms at a safe height above the floor, and asked that there be no requirement for huts - as opposed to bothies, a term it was clearly a little uncomfortable at being included in regulatory language - to be associated with energetic activities such as mountaineering; it considered that "people should be free to, and will, use huts for all sorts of non-energetic purposes, such as reading". These two concerns were echoed in the MCofS and several other responses, and also in the RS/Thousand Huts response, which also raised issues about nearby chemical toilets, and walkways. HIE considered that bothies should be excluded from the proposals "since the vast majority will not benefit from the proposed criteria; most 'new' bothies are created from ruinous stone buildings of more than one storey and more than 30 m2. Bothies are quite different to huts in regard to bothies' remoteness, relatively small number, geographic dispersion, unlocked free-of-charge nature, lack of services and, fundamentally, that their continuing availability is contingent on the goodwill of their owner". It suggested that bothy renovation and maintenance would be simplified by the replacement of Building Regulations by a Good Practice Guide. NTS supported the proposed relaxation of building regulations but considered that that "should not mean relaxation of relevant planning controls in relation to the siting and design of buildings." Aberdeenshire Council suggested only the addition of a requirement for CO and smoke detection. To the writer's mind, Forestry Enterprise Scotland (the executive arm of Forestry Commission Scotland) is a key player, as it owns much potentially suitable land, and is already involved in a pilot project on its land near Saline in Fife. As a public agency, they are bound to follow Government views, and indeed may see hutting as a good way to pursue their remit towards corporate social responsibility and (local) community engagement. However, a recent meeting with two FES staff in Grantown-on-Spey suggested no immediate FES involvement with hutting in that area, and there is little FCS land on Deeside. However, other areas within or near the North East might become involved, such as on Tayside where there are several FES forests, or the Glenlivet Crown Estate near Tomintoul. Further up the hill, or further out in the "wilds", the proposed relaxation of the regulations does not appear to present much of a change in itself. Peter Aikman of the MBA notes that, over and above any of the formal permissions, it is for each bothy Maintenance Officer to discuss with the estate and have their agreement to make any alterations. Doing so helps to cement the MBA's partnership with the owners who then often go on to give a lot of help with logistics. More important may be alterations in attitudes towards bothies amongst owners, maintainers and users (actual or potential). If a "free-for-all" culture becomes established, then unauthorised "huts" may begin to "appear" in various secluded sites, as has in fact happened recently in the Cairngorms. In that case, landowners will have to decide whether to remove the new building, risking bad feeling and possibly even retaliatory action amongst its constructors, and hillwalkers and cyclist will have to decide whether the new erection is a "public" bothy or not. Of course, no-one wants to discourage volunteering, and private initiative is at outdoor exploration and enjoyment.